In this Feb. 11, 2019 file photo, Iranian Revolutionary Guard members attend a ceremony celebrating the 40th anniversary of the Islamic Revolution, at the Azadi, or Freedom, Square in Tehran, Iran. In the latest escalation of tensions between the United States and Iran, President Donald Trump on Monday labeled Iran's elite Revolutionary Guard Corps (IRGC) a foreign terrorist organization — an unprecedented move that marks the first time the U.S. has formally named another country's military as terrorists. Experts say the decision will likely raise the already strained relationship between the two countries to a much higher level. FILE PHOTO: An Iranian Officer of Revolutionary Guards,is is shown during graduation ceremony, held for the military cadets in a military academy, in Tehran, Iran June 30, 2018. The Revolutionary Guard Corps, known in Iran as Pasdaran, was founded in April 1979 shortly after the Islamic Revolution and the overthrow of Iran's pro-western monarch Mohammad Reza Shah Pahlavi. The IRGC's core task, as mandated by late supreme leader Ayatollah Khomeini, is to protect the country's Islamic system and revolutionary values. "In principle, the Iranian state could eventually reform itself outside the bounds envisioned by that revolution, in spite of the numerous constitutional safeguards Khomeini set up, to include clerical oversight of the elected government," said Brad Patty, a former U.S. army adviser and analyst. "In practice, the IRGC exists to ensure that never happens. 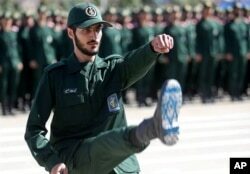 The population of Iran may wish what it will, but they are meant to live in terror of the IRGC." The IRGC today has become a major military, political and economic player in Iran, with an estimated 150,000-strong military consisting of ground forces, navy, and air units. It is also in charge of the country's ballistic missiles and nuclear programs. Internally, the IRGC also commands the Basij Resistance Force, a religious volunteer group that channels popular support to the regime and suppresses domestic dissent. The paramilitary force monitors compliance with the country's strict customs, such as arresting women who violate the regime's public dress codes and raiding Western-style parties where alcohol may be served. Externally, the IRGC's uses its shadowy Quds Force led by Maj. Gen. Qasem Soleimani and proxy Shiite militias such as the Lebanese Hezbollah to extend its influence across the Middle East and beyond. 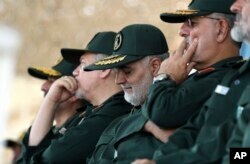 In this June 30, 2018 photo, released by an official website of the office of the Iranian supreme leader, Gen. Qassem Soleimani, center, who heads the elite Quds Force of Iran's Revolutionary Guard attends a graduation ceremony. FILE-- In this Aug. 22, 2013 file photo, a female member of the Iranian Basij paramilitary militia, affiliated to the Revolutionary Guard, receives bullets during a training session in Tehran, Iran. Analysts say the U.S. decision Monday to sanction the IRGC entirely will allow Washington to introduce further sanctions on Iran in the future as a part of the Trump administration's strategy of putting "maximum pressure" on the Iranian regime. The sanctions will particularly affect the business sector in Iran, given the IRGC's involvement in economic activities, an analyst and journalist based in Tehran told VOA on the condition of anonymity because of potential scrutiny by the government. "This sanction with its huge economic and travel limitations on IRGC is not limited to the unit itself. The IRGC is a multibillion dollar conglomerate economic cartel which controls organizations, companies and entities across the country and overseas. With this sanction, the fate of individuals and other companies who have business ties with it will be affected." "This is a chance for Iraq to distant itself from Iran," Pregent said, adding that the Iranian IRGC has used Iraq's Popular Mobilization Forces to directly shape governance in Iraq. "It will certainly strengthen pro-Iran groups in Iraq calling for the expulsion of U.S. troops and, I believe, it will decrease U.S. influence, as Iran is not going anywhere, while Trump is cutting both troops and aid," she said.